Placenta praevia is where the placenta is fully or partially attached to the lower uterine segment. It is an important cause of antepartum haemorrhage – vaginal bleeding from week 24 of gestation until delivery. In this article, we shall look at the pathophysiology, clinical features and management of placenta praevia. Minor placenta praevia – placenta is low but does not cover the internal cervical os. Major placenta praevia – placenta lies over the internal cervical os. A low-lying placenta is more susceptible to haemorrhage, possibly due to a defective attachment to the uterine wall. Bleeding can be spontaneous, or provoked by mild trauma (e.g vaginal examination). Additionally, the placenta may be damaged as the presenting part of the fetus moves into the lower uterine segment in preparation for labour. Fig 1 – Placenta praevia is where the placenta is attached to the lower uterine segment. The main risk factor for placenta praevia is previous caesarean section. There is a 1 in 160 incidence associated with 1 previous section – this rises to 1 in 60 with 2 previous sections, to 1 in 10 with 4 sections. Any woman presenting with antepartum haemorrhage (APH) should be assessed in a systematic manner (see box below). Placenta praevia classically presents as painless vaginal bleeding, this can vary between spotting to massive haemorrhage. There can be pain if the woman is in labour. Examination may reveal risk factors pertinent to placenta praevia – e.g. c-section scar or multiple pregnancy. The uterus is usually not tender on palpation. How much bleeding was there and when did is start? Was it fresh red or old brown blood, or was it mixed with mucus? Was it provoked (post-coital) or not? Is there any abdominal pain? Are the fetal movements normal? Are there any risk factors for abruption? e.g. smoking/drug use/trauma – domestic violence is an important cause. If the bleed is ongoing, or if there has been a significant vaginal bleed, ABC assessment and resuscitation is vital. If the woman is clinically stable, proceed to examination. Pallor, distress, check capillary refill, are peripheries cool? Does the uterus feel ‘woody’ or ‘tense’ (which may indicate placental abruption)? Check the lie and presentation of the fetus/fetuses. Ultrasound can be used to help. Check fetal wellbeing with a cardiotocograph (CTG) at 26 weeks gestation or above: (otherwise auscultate the fetal heart only). Externally e.g. by looking at pads. Cusco speculum examination: avoid this until placenta praevia has been excluded by USS. Look for whether blood is fresh red or dark. How much blood is there? Are there clots? Are there any cervical lesions? Is there any cervical dilatation, or any chance that the membranes have ruptured? Digital vaginal examination: A digital vaginal examination with known placenta praevia should NOT be performed as it could cause massive bleeding. In minor bleed, when placenta praevia is excluded, it can help to establish whether the cervix is beginning to dilate. Avoid digital VE if the membranes have ruptured. 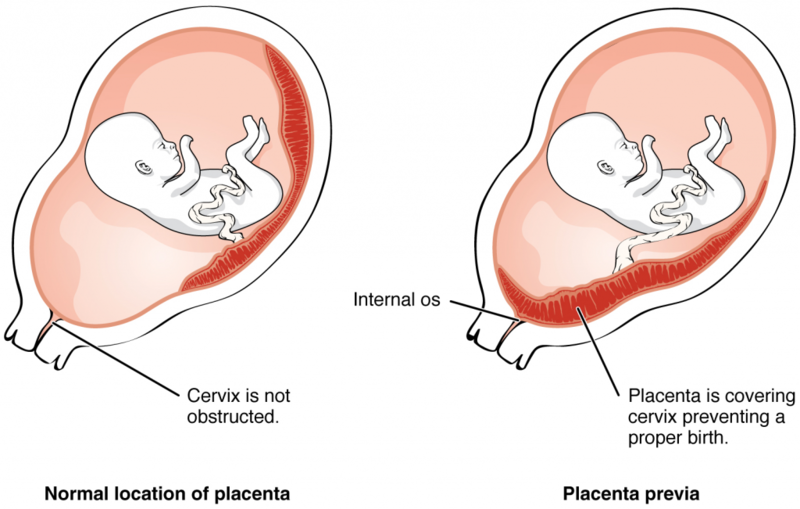 Placental abruption – where a part or all of the placenta separates from the wall of the uterus prematurely. Vasa praevia – where fetal blood vessels run near the internal cervical os. It is characterised by a triad of (i) Vaginal bleeding; (ii) Rupture of membranes; and (iii) Fetal compromise. The bleeding occurs following membrane rupture when there is rupture of the umbilical cord vessels, leading to loss of fetal blood and rapid deterioration in fetal condition. 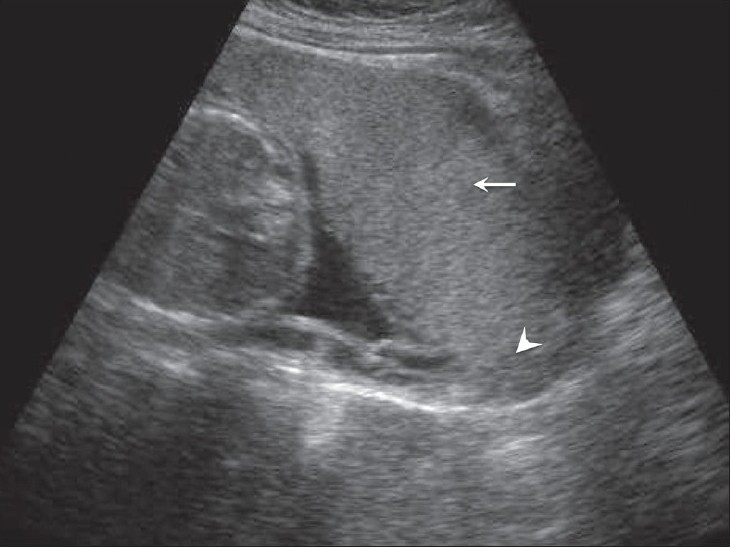 Uterine rupture – a full-thickness disruption of the uterine muscle and overlying serosa. This usually occurs in labour with a history of previous caesarean section or previous uterine surgery such as myomectomy. Benign or malignant lesions – e.g. polyps, carcinoma. cervical ectropion (common). Infections – e.g. candida, bacterial vaginosis and chlamydia. Fig 2 – Cervical ectropion on speculum examination. This is a common cause of antepartum haemorrhage. If major bleeding is suspected, resuscitate and perform investigations simultaneously. Full blood count – assess any maternal anaemia. Kleihauer test – if the woman is Rhesus negative (to determine the amount of feto-maternal haemorrhage and thus the dose of Anti-D required). Group and Save – if blood group is unknown. Cross-match – if the clinical presentation is likely to warrant transfusion. In women above 26 weeks gestation, a cardiotocograph (CTG) should be performed to assess fetal wellbeing. The definitive diagnosis of placenta praevia is via ultrasound. There is a short distance between the lower edge of the placenta and internal os. Fig 3 – Anterior placenta previa. The placenta (arrow) has covered the internal os completely (arrowhead). Any woman presenting with a significant antepartum haemorrhage should be resuscitated using an ABCDE approach. Do not delay maternal resuscitation in order to determine fetal viability. Placenta praevia minor – a repeat scan at 36 weeks is recommended, as the placenta is likely to have moved superiorly. Placenta praevia major – a repeat scan at 32 weeks is recommended, and a plan for delivery should be made at this time. In cases of confirmed placenta praevia, Caesarean section is the safest mode of delivery. Placenta praevia major usually warrants an elective Caesarean section at 38 weeks. In all cases of antepartum haemorrhage, give anti-D within 72 hours of the onset of bleeding if the woman is rhesus D negative.